This post is the second in a series explaining in some depth my Investment Policy Statement (IPS). This IPS is my north star, my lodestone – what I can use to explain to myself, or Mrs FIRE, or a financial adviser, or you dear reader, how I am trying to organise my investments – so that panic, greed, forgetfulness or ignorance don’t influence my decisions for me. Part 1 explained my Philosophy. The key word was diversification. I also allocate across brokers. Those VUKE shares are held in multiple places. And so are my PRU shares. And my NXT shares. Why? Obviously if something happens to NXT then that affects all my holdings in it. But if there is some accidental or fraudulent co-mingling of nominee funds at broker 1, which contains some of my NXT portion, then I’m going to be affected. 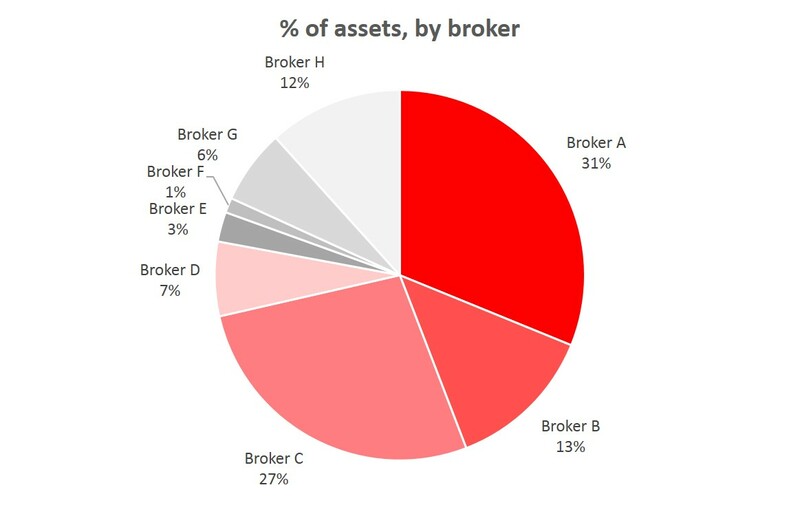 So it’s better to spread the holdings across brokers (see figure). This creates a reporting headache. I handle this with a spreadsheet. I dump my positions from each broker into the spreadsheet and it then consolidates it all for me. Without spreadsheets, I’d be lost. I don’t have fixed allocations for either fund providers or brokers. These decisions are somewhat ad hoc but based on a range of factors. The next two questions concerning allocation are security type and geography. On security type, there are a variety of different approaches out there but they generally boil down to: you should have at least equities and bonds, and maybe some of a) cash b) commodities c) property d) gold and even potentially e) classic cars f) wine. My life at large includes commercial property, residential property, private company investments as well as my liquid investment portfolio. But for the purposes of this blog I am discussing the liquid investment portfolio, and this has a key security split: Equities are by far the largest portion. Equities are a claim on productive assets; a share is a piece of a durable, profitable business. This usually means they pay dividends. And as a share in a real thing, equities on average go up with inflation. Historically they have delivered returns far in excess of inflation. And in the UK, and the US, and a few other countries, the market environment of equity investors is well organised and fair, with a clean market and fair treatment of minority shareholders. All in all, I like equities. How much equities to hold? One rule of thumb says you should hold your age in bonds, and the rest in equities. I think this logic isn’t bad if your lifestyle is determined by your net worth, or if you would struggle with a sustained drop from peak of your net worth. I however hope this logic doesn’t apply to me; I want to reach retirement with my net worth far higher than could meaningfully affect my lifestyle (cf Warren Buffett, who hasn’t moved house for decades). And I hope to be able to be sanguine about drops in value of my portfolio (as Warren Buffett purports to be). So I think I can afford to go long on equities, i.e. overinvest relative to my peers. I’ll discuss the exact percentages in a later blog. The counterpoint to equities are traditionally bonds (‘fixed income’), and cash. Much as I like equities, I have learnt to love bonds too. I love the cash they spit out. I love how they are not very correlated with equities (which in practice means that when equities are falling sharply my bonds are usually doing something else entirely). And in recent years I love how their value keeps increasing, even while every analyst and their dog proclaims the top of the bond market. Within bonds, I am not fussy. I don’t particularly mind between long and short dated; between sovereign or corporate counterparts; between triple A or junk credit. Everything has its price. Which leaves cash. I acutely remember running out of the stuff in 2008/9, even when I smelt buying opportunities by the dozen. So I appreciate Warren Buffett’s cash-for-optionality argument. However I would have used whatever cash I had well before the bottom of the dip. I hate having cash sitting around. I feel that having say 10pc the portfolio in cash earning nothing just dilutes my returns by 10pc. So I tend to keep my cash balances pretty tight where I can, by reinvesting cash immediately. The cash that piles up tends to be in a couple of specific accounts where trading needs paperwork and thus happens only rarely. I should mention margin/borrowings. I don’t strictly consider margins and borrowings to be an allocation decision but perhaps I should. I have a residential mortgage which I don’t think of as part of my investment portfolio, and I have some margin on a couple of US accounts which reduces my net USD cash balance. Finally, a few words about geography. My approach to geography is somewhat unusual. For me the biggest factor is the ‘matching principal’: that my assets and income should, geographically, roughly match my life. My life is roughly 75:10:10:5 UK:Continental Europe:Australia:other. Such a split of assets would lump the USA, Asia etc into Other’s 5pc, which feels underweight. The next factor for me is share of world markets (or, roughly, wealth – see figure). The USA has about a third, and the UK is only 6pc. Japan is bigger than the UK. On this measure the UK feels too low. Finally, I stick to what I know and trust. I am broadly suspicious of equity markets outside the UK and the US, where the dual share structures, lack of clarity around shareholder value, less familiar regulatory environment and variable respect for the rule of law all create, in my mind, a risk premium that must be covered. Not to mention my monolingual ignorance of other places, which hinders my ability to research situations and parse written material. Sticking to English language markets would leave me with the USA, the Commonwealth and Ireland – not a bad subset to play with, but underweight on Eurozone and Asia. Overall I try to strike a balance which trades off ‘home bias’ with exposure to the biggest and best markets in the world. A rough exposure of 50:20:20:10 UK:US:other:Australia feels OK to me. In practice my target allocation is a bit higher on the USA and a bit lighter on other markets than this might suggest, mostly due to personal historical factors. In the next post I look at my approach to Funds and Accounts in more detail. Have been following your posts after linking through from Monevator – really enjoying them so far and a lot of it resonates as your objectives and approach are very similar to mine (also in London, planning to retire early but with no intention of moving out, spending (much…) less). The points about broker and provider diversifiation definitely gave pause for thought – I’m doing pretty terribly on this front. Hi, Great post thanks. FYI the GDP image in this post is broken (3 years later). better late than never, I have just fixed the GDP image – thanks to your prompt. Much obliged!